Randy Johnson was born on Tuesday, September 10, 1963, in Walnut Creek, California. Johnson was 25 years old when he broke into the big leagues on September 15, 1988, with the Montreal Expos. His biographical data, year-by-year hitting stats, fielding stats, pitching stats (where applicable), career totals, uniform numbers, salary data and miscellaneous items-of-interest are presented by Baseball Almanac on this comprehensive Randy Johnson baseball stats page. Did you know that only eighteen pitchers in Major League Baseball history have earned a win against all thirty Major League teams? Sportswriter AJ Cassavell once wrote, " Beating one Major League team figures to be difficult enough for a starting pitcher. Beating all 30 of them, however, is nothing short of pitching history ." We agree and are pleased to present the I've Beaten Every Major League Team "club" that includes these 18 twirlers: Kevin Brown , A.J. Burnett , Bartolo Colon , Dan Haren , Tim Hudson , Randy Johnson , John Lackey , Al Leiter (who started the "club"), Kyle Lohse , Derek Lowe , Jamie Moyer , Terry Mulholland , Vicente Padilla , Max Scherzer , Curt Schilling , Javier Vazquez , Woody Williams and Barry Zito . 1 - Randy Johnson threw one perfect game ( May 18, 2004 ) and one additional no hitter ( June 2, 1990 ). The Big Unit got close a few more times finishing with an additional four one-hitters and six two-hitters. 5 - Randy Johnson is a five-time Cy Young Award winner and when he won the 1999 National League Cy Young Award , he joined Gaylord Perry and Pedro Martinez as the only pitchers to have won the Cy Young Award in both the American and National Leagues (at that time). 9 - Randy Johnson had an Immaculate Inning on September 2, 1998 , throwing exactly nine pitches and all nine of them were strikes (three outs). 12 - Randy Johnson had 12 games in the National League where he struck out at least fifteen batters, a senior circuit record for Games in a Career with 15+ Strikeouts . 16 - Randy Johnson struck out sixteen batters on July 18, 2001 , the Major League record for Most Strikeouts in a Game by a Relief Pitcher . 19 - Randy Johnson struck out nineteen batters on June 24, 1997 , and nineteen batters on August 8, 1997 , the American League record for Most Strikeouts in a Game by a Left-Handed Pitcher . 24 - Randy Johnson was the twenty-fourth member of the 300 Wins Club , joining on June 4, 2009 . 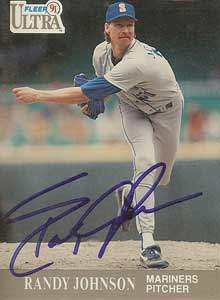 The Big Unit was the first pitcher to win his 300th game on his first try since Tom Seaver , who joined 24 years earlier on August 4, 1985 , his first try at win #300 . 114 - Randy Johnson had 114 games in the National League where he struck out at least ten batters, a senior circuit record for Games in a Career with 10+ Strikeouts . 29 - Randy Johnson had 29 games (across both leagues) where he struck out at least fifteen batters, a Major League record for Games in a Career with 15+ Strikeouts . 4,875 - Randy Johnson struck out 4,875 batters [#2 on the Top 1,000 All-Time ], the Most Strikeouts in Major League history by any left handed pitcher . The Sporting News, on September 24, 2009, announced their Team of the Decade which was composed of Joe Mauer (catcher), Albert Pujols (first base), Jeff Kent (second base), Derek Jeter (shortstop), Alex Rodriguez (third base), Barry Bonds (outfield), Ichiro Suzuki (outfield), Manny Ramirez (outfield), David Ortiz (designated hitter), Randy Johnson (starting pitcher), Mariano Rivera (closer) and Joe Torre (manager).